Today's workplaces are dynamic, so it shouldn't surprise anyone that tension can develop quickly and ruinously. The Essential Workplace Conflict Handbook is the ideal resource for anyone ready to confront conflict at work rather than run from it. Managed correctly, conflict can be a positive source for innovation and creativity. What's changing in the workplace and the workforce today? What's my conflict style, and why is it important? "In their latest book, Mitchell and Gamlem do a great job identifying some of the causes of conflict and offer suggestions on what individuals and organizations can do to resolve and manage them. Through stories and advice, they give readers the tools they need. This is a must-read for managers, HR professionals, and employees!" "Mitchell and Gamlem, two experienced and talented HR professionals, have produced a book rich in content...on an extremely important and difficult topic. 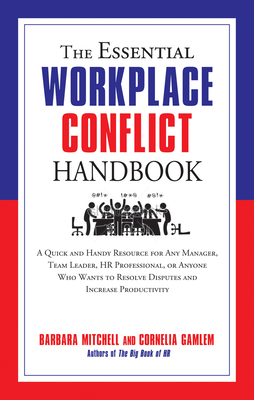 The Essential Workplace Conflict Handbook provides proven techniques for dealing with conflict in organizations of all types. The specific examples give much-needed insight into conflict management." "...practical guidance on how to diagnose sources of conflict and proven practices to nip it in the bud. If you're working with other people, you need to read this book."